Steven Valleau has got it made. He's a master wood-carver, and he gets to pursue his passion of bird carving as the Carver-In-Residence at the Wendell Gilley Museum. He get to share his skill with the local population. Finally, and perhaps best of all, he gets to spend a lot of time in Southwest Harbor, Maine. Last week I spoke to the Executive Director and Curator of the Wendell Gilley Museum, Nina Gormley, about the history and current state of bird carving. This week I talked with Steven Valleau about the finer points of carving birds: what birds make good subjects, how to choose your tools and, yes, his driveway. What drew you to carving birds over other subjects? SV: I started making bird images in the form of colored pencil drawings when I was about 10 years old. That’s forty years ago now. I had always been interested in drawing since I could hold a pencil. My father Dr. William G. Valleau was a Zoology professor at the University of Maine so I had access to pictures and information about animal life. The first big piece that I remember was a huge piece of paper covered with dinosaurs probably done in pencil and crayon. As we now know my drawings and the actual beasts evolved into birds. I really began focusing on birds when my uncle Jack Hartleb who was stationed at Dow Air Force Base in Bangor began taking me birding during his weekends off in about 1967. It seems funny now but much of the time we just drove around in his big old barge of an Oldsmobile and would look and occasionally listen for birds. We often drove through the Bangor (Caribou) bog, drove by the Bangor Pool in the Penobscot checking for ducks and eagles. Once someone got credit for a flock of golden Plover at a farm pond that was where Home Depot is now that my Uncle was the first to spot. I could elaborate on birding in the Bangor area in the late sixties but I’ll spare you. During the years he was in Bangor before being shipped out along with all the B52s to Thailand my uncle Jack and my father started to carve some duck decoys. My father had a student, Don Mares who had some success with a Black Duck decoy at the Sports Show competition at the Bangor Auditorium so they started some duck heads that never got bodies. So my first bird carving is a Black duck body with a head that my uncle carved. I never got his permission to do that. A bit late now. From my conversation with Nina Gormley, it seems that your development mirrored the general development of bird carving: duck decoys into artistic pieces. How long did it take for you to start carving other species? SV: Those initial carvings of duck heads for the most part were very crude. My Uncle Jack’s black duck head was quite good which is why I procured it but the ones I did were pretty bad. At first my only tool was a 3 inch diameter sanding drum on a drill press and the wood was just 2x4 ends left over from my parents’ new house. It was probably around 1970, when I was old enough to cut blanks out on the band saw, that I started carving owls, wrens and chickadees. The first non duck I carved was a saw whet owl. Along with a change in tools my uncle and father found out that Basswood was the wood you wanted for carving birds. The construction lumber that we had been using was just about the worst wood for ease of carving. One nice thing about carving decoys is that the challenge of making feet is avoided. I tried many methods of making metal feet including casting them in lead and using twisted wire. Making a carving with legs is of course the only way give full expression to a representation of a bird. At this point I spend at least as much consideration if not time on the habitat that grounds the bird as on the bird itself. Carving a decoy is like a vacation from work. So do the idea for your carvings start from the habitat up or start from a particular species and work down? SV: We start from a particular species although for a particular bird blank the perch has to be reflected in the design of the individual bird because it's body has to actually perch on the base. One leg may have to be forward of the other or the body may have to be tilted for the bird's center of gravity to located where it would be in a natural pose. So we start by choosing a species to carve and assembling as much reference material as we can get our hands on. I maintain a couple photos files, one for myself, one for the museum, which consists largely of photos from magazines but also postcards, cards, newspaper clippings and photo prints. 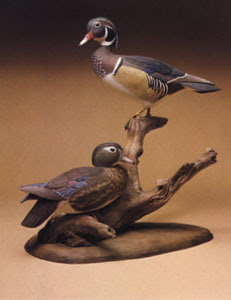 Wendell Gilley also did this as well as making his own taxidermy collection of bird mounts. Over the course of fifty years Wendell Gilley put together a collection of most North American ducks and owls and many other bird groups. We still use this collection at the museum. I teach bird carving classes and I would say the biggest downfall in my students involves not looking at reference material. How can you carve something without knowing what it looks like? I suppose a person has to learn how to interpret photos. A given photo may not be of a bird in the desired pose but it may show an actual crease between feather groups that in a head on shot only looked like a difference in feather coloring. When I design a bird if I don't have a particular habitat or bird in mind I at least know that the landing place can accommodate the bird or birds I've designed . The habitat has to be big enough for a flock if that's what's called for. That's why I sometimes make models before committing to a design to be put into wood. I can 'sketch' out a bird very quickly in floral foam and get a rough idea of whether it will physically fit on a branch or if really looks the way I imagined or if it can look better in some other place. Right now I'm working on a tangle of bittersweet that was only intended for a pair of chestnut-sided warblers that is part of a collection of warbler pairs that I'm making for the Wendell Gilley Museum but I have reference photo of an immature yellowthroat that may end up scolding them from one side of that vine. Sometimes the habitat does suggest the species of bird. So once you've got a firm idea and know that it will work out (fit on the branch, etc), what's the first step of actually carving the piece? SV: After I had the designs for the piece drawn I transfer them to a piece of usually basswood and cut them out on a band saw. Most carvings are two pieces of wood: one piece for the head and one for the body, as in a decoy. This is sometimes because of the size of the piece but usually because we want to use the wood’s grain direction to add strength to fragile extremities like bills and necks. So the more fragile extremities (herons, sandpipers etc) the more difficult the sculpture? Which species are harder to carve than others? SV: A bird at rest is relatively easy to carve. Birds are very aerodynamically formed creatures so their parts naturally flow into each other. They are somewhat less articulated than mammals. Think of a chimney swift or penguin vs. a race horse or a cello player. I consider fish even easier to carve because they are even more highly evolved to be aerodynamic. This is not to say that it doesn’t take just as much skill to shape a fish well but the nature of the possible poses is less complex. It isn’t so much the fragile nature of the bill that makes a heron more difficult but that the neck is a significant form that you just don’t have to deal with in humming bird. There are two basic approaches to carving. The first, perhaps more pure one is a form of subtractive sculpture, in that no pieces are added to the original single block of wood. These blocks are usually of highly figured wood and are unpainted to show the beautiful patterns created in woods’ growth. In these sculptures if part of the bird is fragile it must simply be carved and handled very carefully. Truth be told, repairs are made if only because clients are clumsier than creators. (Remember hiding repairs is also an art.) Charles ‘Chippy’ Chase (deceased) of Brunswick, Maine and John T. Sharp of Kent, Ohio are probably the most well know natural wood bird sculptors. Chippy used the term subtractive sculpture to describe what he did but he really thought the word sculpting means taking away so that ‘sculpture’ was description enough. The second approach to carving is what Chippy called assembling. I prefer additive sculpture, I suppose, but modeling might describe it better. Modeling is what one does with clay because they are no limits to changes one can make. Unlike clay, wood has grain and lines of fracture and since our carvings are intended to be painted anyway we put together pieces of wood in a way that enhances the final product’s strength and/or ease of carving. The woods of choice, Basswood and Tupelo are homogenous, devoid of the figure sought by subtractive sculptors because this makes for easier carving and painting. The use of separate pieces of wood can be extreme. In the early eighties the state of the art was to cave hundreds of feathers separately and attach them to the body form. This thankfully was just a phase. This brings up another aspect of birds that makes them somewhat unique as a subject. Once you pluck ‘em they all look like a chicken. Their legs and beaks may vary but with the exception of penguins and maybe kiwis anything from an eagle to a titmouse isn’t very different. Their shape is all in their feathers. Of course their feathers can be extremely different from species to species even within a species or an individual for that matter. The flat nature of their feathers, and the fact that the texture of feathers can be easily reproduced by woodburning or grinding, has allowed the extreme realism approached by the best bird carvers. The same is true of fish but not most mammals. I understand even computer animators have a hard time with hair and fur. To answer the second part of the question, some birds I wouldn’t even attempt to carve. Birds with long plumes like peacock or even a rooster with raised hackles is beyond what I want to attempt. Of course painting is more difficult than carving. I find the colors in a blue jay very hard to get right and the vermiculating on a mallard can take days. What tools do you use to carve your birds? SV: The tools I use to shape a carving start with a band saw which is a large shop tool. My band saw is capable of cutting curved edges on wood with sectional dimensions as large as 14” x12”. That’ a big piece of wood, larger than anything one is likely to find in this area. The band saw is also capable of cutting out blocks as small as hummingbirds so it is a very versatile tool. The first shaping is laid out using a plan view and a profile view that are drawn using various reference materials. Some carvers continue roughing and shaping the blank using nothing but power rotary tools. These tools are familiar to most people as Dremel tools which is a hobbyist brand of the professional Foredom rotary tools that most serious carvers use. If time permits I prefer to use hand tools because one reason I enjoy carving is the sensation experienced in pushing a sharp blade through wood. For large pieces I use draw knives, spoke shaves and large chisels. The carving tool that I use more than any other is a small knife with a 11/2” blade that has a razor sharp replaceable blade. This knife is one of several models made by Warren Cutlery Company in Rhinebeck New York. The final texturing of the carving is done with a piece of sandpaper, a wood burner or a small rotary tool. Textured carvings are almost always painted so the next step is sealing or priming the surface in preparation for paint. If a novice wanted to start carving birds would they need these same tools or could they start with something simpler? SV: A novice carver can buy blanks already cut out from various suppliers such as sugarpinewoodcarving.com. We sell blanks at the museum and I will do custom cutting up to a point. I’ve had people want so many blanks that t I can’t supply their needs and those of my classes. Adult education programs often offer wood shop classes that offer instruction and access to a band saw and other large shop tools. You can also buy basswood blanks on eBay and for a knife use an X-acto knife. That’s probably the simplest way to go. Patterns are available from several sources including mdiwoodcarvers.com which is where I get most of my supplies. Do you have a favorite bird carving of all the ones you've done? SV: I don’t really have a favorite carving but there are commissions that stand out as most memorable or satisfying. I made a life sized Osprey th for a man with a house in the Bahamas about 15 years ago. Because of the combination of the species, a new level of price, a certain level of challenge and my personal feelings about the client, that commission was particularly satisfying. I paid for the driveway of my first house with the money from that bird so it had a lasting significance beyond daily living expenses. The osprey had to be shipped by air to the Bahamas so I spent 20 hours plus making the foam lined plywood crate. Probably most importantly, I really liked the man for whom who I made this carving. I made many carvings for him including at times when one or the other of us were going through hard times. Although bird carving is a job for me the friendships I’ve made over the years seem dearer than the pieces themselves. What a great story. It must be very satisfying to create a life for yourself based on your artwork. OK one last question: If time and money were no option, and you had a gigantic block of wood, what would you carve?